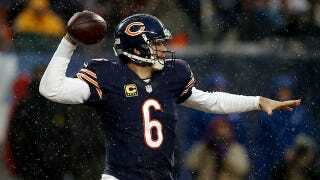 The Chicago Bears, via the press conference's answer to War and Peace, announced this morning that Jay Cutler has signed a seven-year extension with the team. The exact details of the contract aren't yet known, ESPN's Adam Schefter reports that it will eclipse an average of $17.6 million per year and comes with "at least" $50 million guaranteed. As we say every time one of these mammoth NFL contracts gets signed, the only thing that matters is the guaranteed money. $50 million would put Cutler's value below Tony Romo's ($55 million) and Matt Ryan's ($59 million), but above Matt Stafford's ($43 million). That's a boatload of money, but it's hard to argue that he doesn't deserve it. There are certainly Bears fans out there who will complain about this signing and argue that the team should have jettisoned Cutler in favor of Josh McCown, but those people are dumb. Today's NFL is a quarterback's league, and one that sees teams slog through deeply depressing seasons with guys like Mike Glennon, Brandon Weeden, and Blaine Gabbert starting. Quarterbacks who can actually play are not easy to find, and the ones that can deserve to get paid. Now, let's get back to debating the question that really matters: Is Jay Cutler tough?